The ADV-8800 is a popular bidirectional 8-channel transcoder designed to convert video/audio between H.264 and MPEG-2 formats, as well as perform resolution resizing and bitrate reduction. The device can be configured to receive multiple IP, DVB-ASI, and DVB Tuners inputs, allowing a wide range of digital program input possibilities. 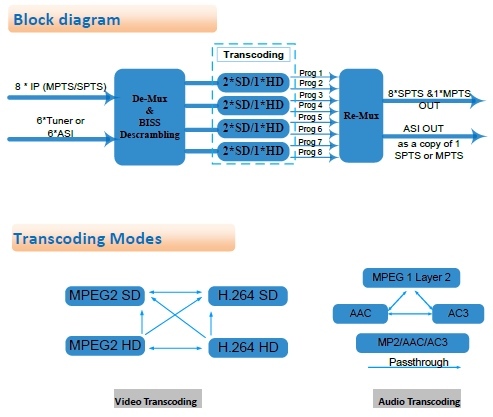 The new transcoded streams can be configured to be MPTS or SPTS and then sent to the IP or DVB-ASI output ports. The ADV-8800 allows broadcast operators to provide high quality transcoding at an affordable cost.